My earliest memory of birthday cakes was when I was very little and demanded a dog shaped cake. I also demanded that the whole entire head was mine and of course felt very, very sick after trying to eat all of that icing myself. I wasn't prepared to share...and not much has changed ever since! When receiving a few recipe books for Christmas, having a flick through and finding this I knew that it had to be the next birthday cake I made for someone else. Not only is it a great recipe, it's also not too difficult to transport on the train if needed! My new recipe book, What to Bake & How to Bake It, is sure to be one of those books I'll always go back to for reference. The difference between many books and this is that each recipe is spread over a number of pages with a step-by-step photo guide. Very handy for things like doughnuts and cinnamon rolls. N.b. this chocolate cake isn't like the usual recipe I use, its egg free, super moist and not too rich...that way the whole family will love it. Heat the oven to 180 degrees and grease and line a 23 x 33cm traybake tin. First, make the cake batter. Gently melt the butter in a saucepan and leave to cool slightly. Into a large bowl, add the flour, cocoa powder, malted milk powder, bicarbonate of soda, baking powder and salt. Use a whisk to stir through (this will do the same as sifting it into the bowl). Add the sugar and continue to whisk to break up any lumps. Whisk together the milk, oil, vanilla extract and melted butter before whisking into the dry ingredients. Start slowly at first until everything is incorporated and then give it a good beat with the whisk. Pour into the prepared tin, smooth over and bake for 30 minutes. The cake should have risen and slightly shrunken at the sides. A skewer should come out clean when poked into the middle. Remove from the oven and leave for 10 minutes before inverting onto a wire rack and leaving to cool fully. Once the cake has cooled, begin to make the frosting. Melt the chocolate in a heatproof bowl over a pan of barely simmering water, stirring a few times until smooth. Heat the milk in a small saucepan until steaming and gently bubbling, not boiling. Into a large bowl, sift the cocoa powder and malted milk powder, gently stir in the hot milk to form a smooth paste. Set aside to cool for a few minutes. Add the butter to the paste, sift in the icing sugar and beat with an electric mixer until creamy. Fold in the melted cooled chocolate. Pour half onto the cooled cake, smooth over with a palette knife before adding the rest and swirling around on top. The frosting will set after 30 mins or so. This cake can be made up to 2 days in advance well wrapped and stored in a cool place. This looks amazing! 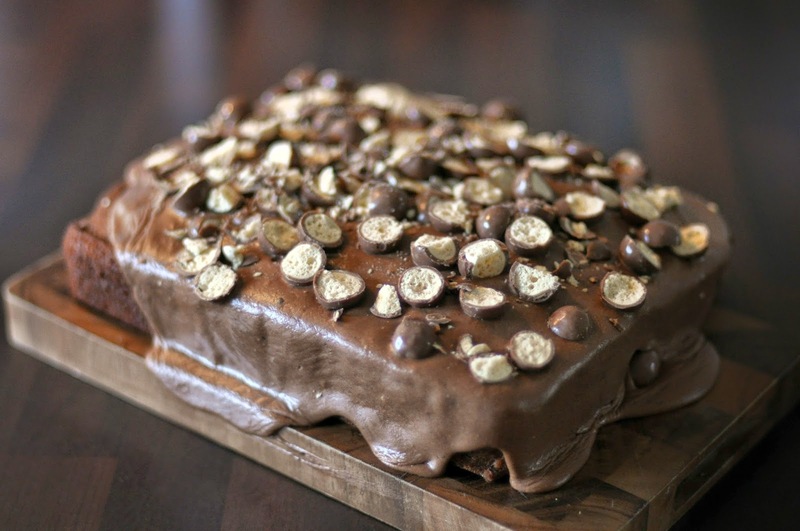 I used to make a malteaser cake at uni but it was made up of a lot of condensed milk...I like that this is a lighter cake. Means you can eat more! ...and eat more I did!! Even though it wasn't even my own birthday cake...oops! OMG! <3 I need this right now!